The URLs listed here may help you find useful information during your stay in Fukuoka: Fukuoka Airport, The LUIGANS Spa & Resort, Fukuoka City, restaurants/souvenirs/events in Fukuoka. Visit those websites by clicking in footers at the bottom of the page. 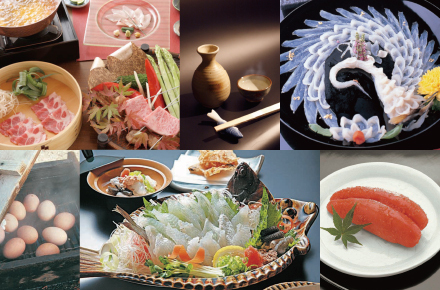 Fukuoka-Hakata is famous for its wide variety of specialties made of fresh seafood from the Genkai Sea and agricultural product from nearby farms. Among them are Mizutaki (boiled chicken hot-pot), fugu (blowfish) dishes and ramen noodles. The downtown is bustling with rows of Yatai (street food stalls) and bars concentrated in Nakasu area, the largest entertainment quarter in the south of Japan. The choices of food experience covers not just traditional cuisine but also high-quality cosmopolitan food from all over the world. 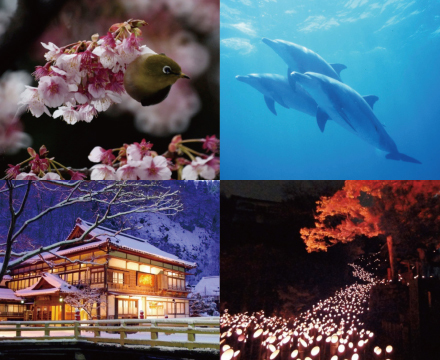 Kyushu – the southern-most island of the Japanese archipelago – showcases the representing beauty of Japan and its tradition. Due to its proximity to Korean Peninsula and China, Fukuoka – also known as Hakata – has developed under a tremendous impact from Eastern Asian culture since ancient times. The trace of the influence is still seen in the typical local handicrafts such as Hakata-Ori silk fabrics and Hakata Ningyo porcelain figures. Hakata Ningyo is a name of a particular style of porcelain figure unique to this region, established more than 800 years ago. Recent archaeological research shows that the primary style of porcelain-figure making was started in Chinese Quarters or temples and shrines in Fukuoka (then called Hakata), at the same time as Kamakura, where the central government was located at the time in 12-13 AD. In 1600 (Azuchi Momoyama Era), Lord Kuroda Nagamasa, an influential feudal ruler, moved to the country of Chikuzen that encompassed Hakata and its surrounding areas. Many craftsmen were gathered accordingly to form a township, where they created the foundation of the refined Hakata style of porcelain figures. Craftsmen like Nakankko Kichibei, Masaki Soushichi (the founder of Sou-Hichi), Shirouzu Buhei, among many others, contributed immensely to development of the Hakata Ningyo industry and its promotion throughout Japan. The figures were highly appreciated as fine artifact and gained nation-wide popularity. In the Meiji Era, the Hakata Ningyo was one of the top exhibits among the highest quality Japanese handicrafts in International Expositions in Paris and other places overseas, receiving high reputation for its sophistication. Later, this particular style of figures called Hakata Ningyo became acknowledged as one of the representative features of Japanese culture and a popular exported commodity. Now there are about one hundred manufacturers who continue to refine and develop their own style of Hakata Ningyo in this city.